The potato is believed to have been domesticated in the area of present-day southern Peru and northwestern Bolivia approximately 7,000–10,000 years ago. In the second half of the 16th century following the Spanish conquest of the Inca Empire the potato was introduced to Europe. It was subsequently conveyed by European merchants to territories and ports throughout the world. 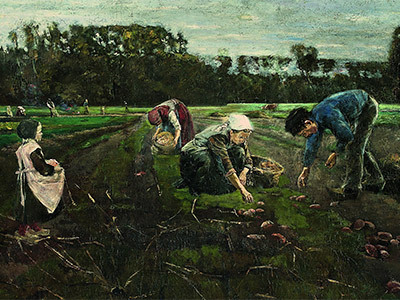 The potato eventually became an important food staple and field crop that played a major role in the European 19th century population boom and to this day remains one of the top crop staples in the world. There are about 5,000 potato varieties worldwide. Three thousand of them are found in the Andes alone, mainly in Peru, Bolivia, Ecuador, Chile, and Colombia. Potatoes yield abundantly with little effort, and adapt readily to diverse climates as long as it is cool and moist enough for the plants to gather sufficient water from the soil to form the starchy tubers. Potato plants are herbaceous perennials that grow about 24 inches high. They bear white, pink, red, blue, or purple flowers with yellow stamens. Potatoes are mostly cross-pollinated by insects such as bees which carry pollen from other potato plants. They can also be propagated by planting tubers or pieces of tubers cut to include at least one or two eyes. Plants propagated from tubers are clones of the parent, whereas those propagated from seed produce a range of different varieties. While there are thousands of varieties of potato, it has been bred into many standard or well-known varieties, each of which has particular agricultural or culinary attributes. 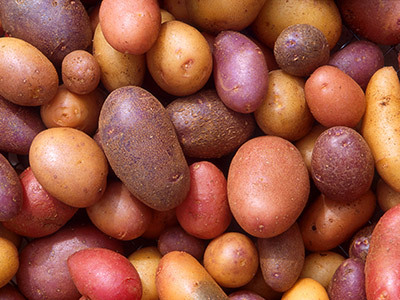 In general, varieties are categorized into a few main groups, such as russets, reds, whites, yellows (also called Yukons) and purples—based on common characteristics. In addition to its many culinary uses potatoes are also used to produce alcoholic beverages such as potcheen, akuavit and vodka. The name “vodka” is the diminutive form of the Slavic word voda (water), interpreted as “little water”. 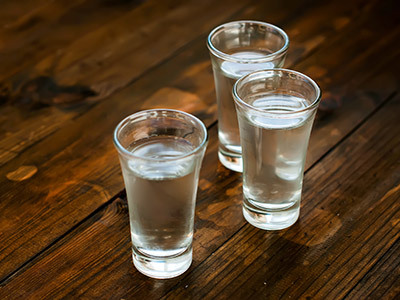 The word “vodka” was recorded for the first time in 1405 in Akta Grodzkie, the court records from the Palatinate of Sandomierz in Poland where vodka has been produced since the early Middle Ages. Vodka is the result of the fermentation, distillation, and filtration of potatoes, though it is also commonly made of other originating ingredients including wheat, rice, and sugar cane. J.A.B. 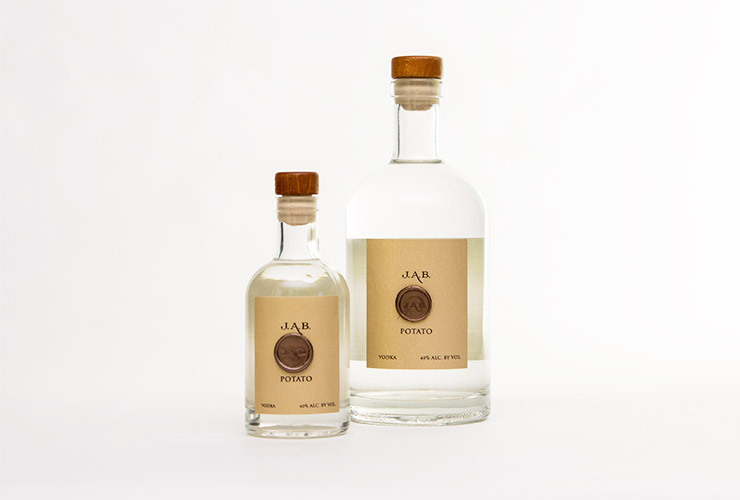 Potato vodka is fermented and distilled from potatoes in Poland. 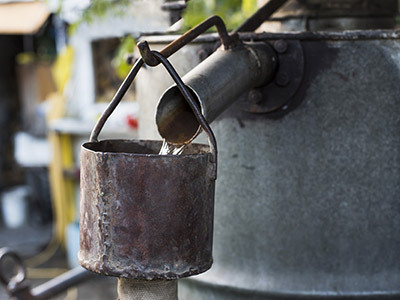 The master distiller is typically in charge of distilling the vodka and directing its filtration, which includes the removal of the “fore-shots”, “heads” and “tails”. These components of the distillate contain flavor compounds that impact the desired clean and crisp taste of vodka. Through several rounds of distillation these flavor components are stripped out and clarity is increased. However repeated distillation of vodka increases the alcohol content which is subsequently lowered to drinking strength, in the case of J.A.B. Potato vodka, by adding pure Italian spring water prior to bottling. J.A.B. Potato vodka is best enjoyed chilled and neat as vodka is traditionally consumed in the “vodka belt” countries of Scandinavia and northern and eastern Europe. It can also be mixed with your favorite mixer or in a classic vodka cocktail such as the martini, the cosmopolitan and the Bloody Mary.